Waterfront Front Park, here in Charleston, Sc, is the most visited park from visitors, and locals. For us engagement, bridal portrait, wedding photographers. This park is full of many opportunity for great photography. Waterfront Park, is a twelve acre park of the Cooper River. In 2007 the park received the Landmark Award from the American Society of Landscape Architect. The Park features a Boardwalk, the very famous pineapple fountain, and the water fountain that every one enjoys, and miles of greenery including a row of amazing palm trees. The water fountain is a place where adults and children can enjoy a nice cool down from the many jets. It is also a great way to compose amazing photography images by using the proper camera techniques. As I captured for this bridal portrait at Water Front Park, here in Charleston, Sc. I first communicated with the bride about how we were going to protect her dress from it all, and that in order to do so we would have to move quickly and effectively to get the bridal portrait we were looking for. 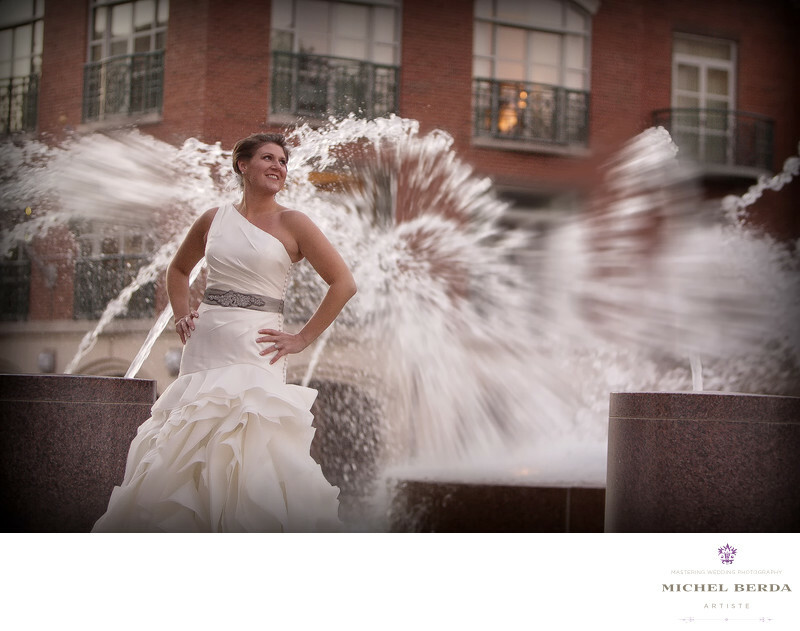 I had to make very sure that all went has planed and in less then 7 minutes, I accomplished just that by having my bride on the left of the frame and freezing the water perfectly as a great background with my negative space. Then by coming back to my studio and master editing the image for this final bridal portrait, photographed at Water front Park.